Age old question asked of the industry: "If advertising works, why don't ad agencies advertise?" Well, they used to. And it looks like they are starting to again. Strawberry Frog caused a bit of a stir a couple of weeks back when Scott anounced on his blog that they would be running a campaign for themselves. Adweek picked it up this week, talking about how agencies promote themselves, riffing around the question above. Obviously I'm slightly biased when extolling the virtues of blogging and that but it is a fantastic way for an agency to raise its profile, whilst giving a flavour of the culture and the ideals that drive it, to prospective clients, as well as getting involved in the global conversations with other practitioners and forming big happy global families. But another way to market your creative skills is to apply them to a specific task. 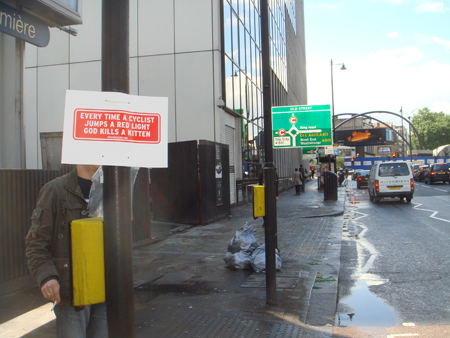 Something Karmarama have taken on with these lovely roadside safety warnings for naughty cyclists. For some reason, using interweb humour at the exact point of transgression to appeal to those of us on bikes who sometimes jump red lights seems to make sense. Well, it did to me this morning anyway. It’s addressed to all those rogue cyclists giving us proper cyclists a bad name and giving laughing Ken Livingstone an excuse to enforce license plates for bikes and fines for leaving the house. But it's not bad meta advertising either. UPDATE: All the signs on my route to work this morning had vanished. 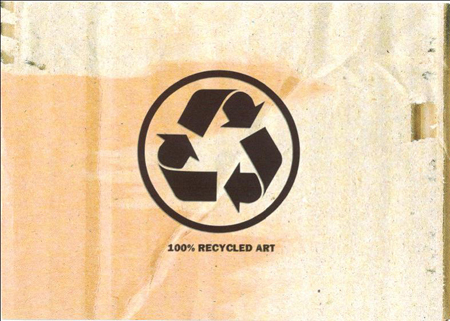 The mega trend that is ethical consumerism is built on the idea of low impact ethics. In essence, people want to do good things and feel good about themselves but in a way that has a low impact on their lives. Additionally, one of the other big barriers to action is the perception that individuals can't make a difference due to the scale of the problems involved. Therefore, an easy way for people to contribute, without having to radically change their lifestyles, and in a way that allows them to feel part of something that has enough scale to make a difference, is for them to buy ethical goods. People still get their products, plus the emotional bonus that comes from buying into ethical brands, and good things happen somewhere. As with everything else, the interweb allows for the development of new models for this behaviour. My mate Rowan reminded me of one today: The Hunger Site. This allows you to donate food to the hungry by clicking, turning the ad revenues of your click into a 'free' donation from you. Lovely. 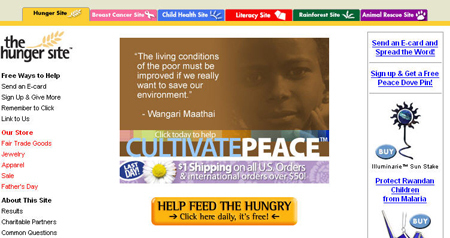 A twist on this idea uses the affiliate marketing relationships online to donate. Portals like GreaterGood and iGive let you buy from large and small online retailers [the smaller ones tend to give better affiliate fees] and then the affiliate kickback becomes the charitable donation, again at no cost to the consumer. Not really cause related marketing or CSR, these intermediaries look at developing mechanisms that enable consumers to direct advertising spend into ethical areas, by leveraging the power of the internet as an aggregator of consumers that advertisers are looking to reach. 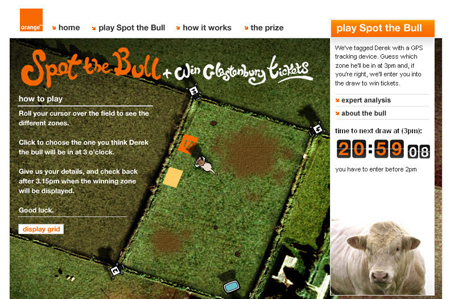 The lovely people of Poke have put a great competition site together for Orange called Spot the Bull. They've tagged a bull with a GPS tracker and you have to guess where in his field Derek [the bull] will be at 3pm each day - winners get tickets to Glasto. As I've said before, I think really interesting things happen when you pull the web and the real world together and this is a really charming idea, with a compelling reason to come back each day and play. Derek - if you're reading this - zone 17 tomorrow mate. Cheers. 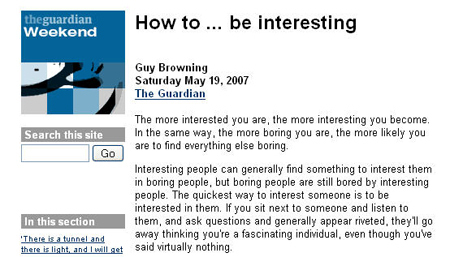 The Guardian has some thoughts about how to be interesting - picking up some of the stuff Russell / Jeffre have been talking about, which have led to Interesting 2007. Beware of being too interesting. People are only interested in what they can understand. If they don't understand you, they will begin to worship, crave or despise you. The Plannersphere Ning just hit 300 members! Exciting! Bravely we shall hold back the forces of evil until the rest of the industry can be convinced to pick up arms! No, seriously, thanks to everyone for getting involved. Hopefully people are finding it useful - if anyone has any suggestions as to how to make it more so - post something to the Ning. 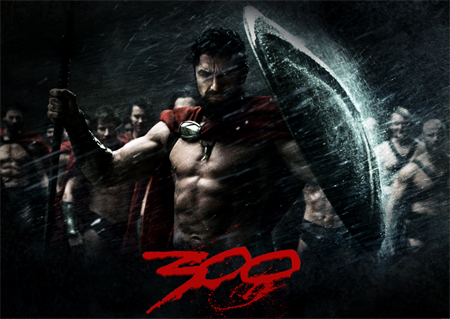 By a complete coincidence I also happen to have just seen 300 and I thought it was fantastic. Despite not being a big fan of gore / violence / war movies, I was blown away. I know I'm a sucker for interesting animation / film crossovers, but I really think there is something interesting happening at the opposite end of the filmic spectrum from the Dogme school - thinking of film as a composite medium, not a way to represent reality. This begins to play into ideas of hyperreality, where you can't tell the difference between fantasy and reality, and as CGI become ever more sophisticated we will no doubt reach a point where, on-screen, there will be no way to pick out the digital from the real, like Gibson's Idoru. In 300 Miller uses the unreliable narrator device to blend historical fact with fantastical flourishes, but increasingly, as the cost of CGI falls, how you portray 'reality' on the screen will be a matter of choice. And when we all have retinal projectors to overlay data on to the world, creating dynamic and individuals HUDs, how we experience reality will be as well. But that's another post. Microsoft have launched a trade marketing campaign with a blog and this cute video, showing the end of the love affair between advertisers and consumers. It's smart and funny, reminding us that being narcissistic is a sure fire way to end your relationship. Whilst it's true that most brands are never going to have anything resembling a relationship with their customers, that doesn't mean you get to take them for granted. I'm sitting on a panel about turning insights into ideas and that at the PSFK conference in London on June 1st, but don't let that stop you coming - there will be loads of other speakers who are really good. With Russell, John, George, Hugh, Iain, Niku, Beeker, Johnny, Jess and Regine in the house, there's not likely to be a dull moment. Although it may be a bit quiet in certain parts of the plannersphere. 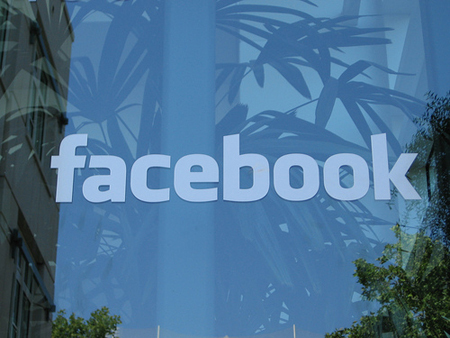 So I finally joined Facebook and immediately became addicted, just like everyone said. So I've been thinking about it and trying to work out exactly why it's so compelling. Apart from the obvious, vaguely disguised "how many friends can I get" game that's inherent to social networks - although facebook is distinct from myspace in this as it is actually people you know, not random bands from Utah who are now your friends - there seems to me two aspects to Facebook that make it so compelling. Firstly, everyone is always there. The most important feature of instant messenger programmes, in some ways, isn't the actual messages - it's the buddy list. With your buddy list there, you're always in a group, you're friends are always present, whenver they're online. This is why it was so compelling, to begin with, to younger people - kids are far more likely to hang out in large social groups. This continuous partial presence is oddly satisfying, and also a feature of services like Twitter and Jaiku and that. Secondly, it allows for phatic and asynchronous communication. The best thing about email is that you don't have to interrupt someone - it's timeshifted communication. The poke feature is the ultimate online expression of a phatic communique - it has only social, not semantic, value. The confluence of these two aspects seems to be why suddenly I find myself back in touch with people who I've not spoken to for years, despite having email addresses or phone numbers. It's just easier to say hi when you can see them right there and poke them. Once in a while, advertising transcends the stratum reserved for commercial communication and becomes a cultural phenomenon - quite literally something that can be seen to have an effect on culture. Many posts ago, my mate Yusuf pointed out that the truly viral part of the 118-118 launch campaign, which could definitely be said to have ascended into the collective consciousness, was shouting "Got your Number!" at people in the street. They did it in the ads, then the boys hit the streets all over the UK and did it in real life. And then everyone was doing it. The ultimate aim of all commercial communication is to spread ideas that elicit a behavioural response. Specifically, we want to influence mass purchase behaviour. But if a brand can propogate some intermediate behaviours, like getting people to shout "Got your number" or "Wassup!" at each other, then you get a whole host of additional benefits. 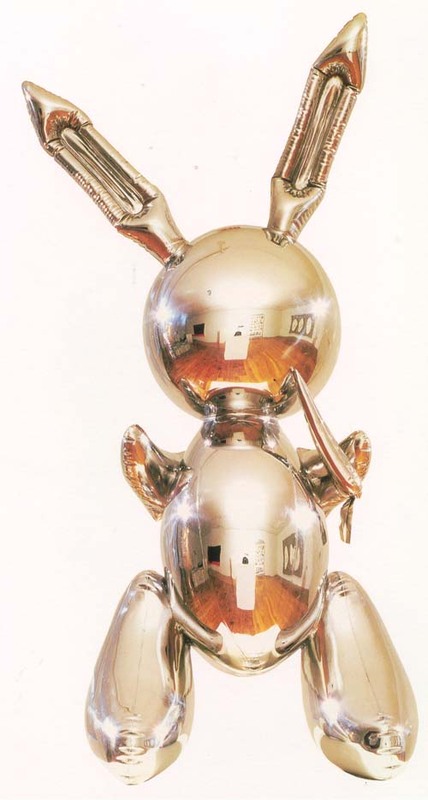 Before consumer generated content was a thing, people made hundreds of "Wassup" spoofs, spreading the message further. In a person's head, the behaviour recalls and reinforces the brand, and vice versa, keeping the brand salient. And, of course, behaviour is viral. 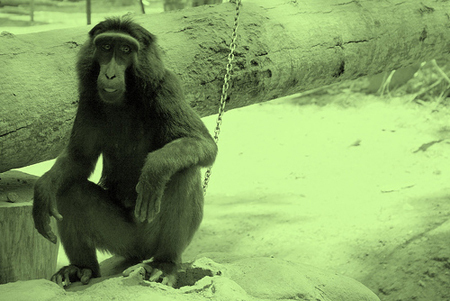 Humans are hardwired to learn by imitating [see Herd]. The drive to copy is so powerful, when children are shown behaviours they know are pointless to achieve the required goals, they imitate them anyway. This behavioural engineering seems to be at the heart of BBH's very successful, ongoing campaign for Lynx / Axe. Young males are perhaps the single target audience most prone to adopting learned behaviours - observe the instances of fist bump in any playground, or indeed pub or office for that matter. Many Lynx executions have imitative behaviours at their core. Pulse - the dance. Click. Bom Chicka Wah Wah. If you want to influence people's behaviour, give them something to copy. UPDATE: Mark has written a great build on this that looks at why copying is such an important human mechanism.